Today we have a selection of Tomica Police cars - two new ones, including one ofvthe brand new Tomica 4D models - with sound and vibrations! But let’s start with an oldie - the Toyota Corona 2000GT Hardtop. This model came out first in 1975 as the #89 and stayed in the line-up until 1980. But this version came out much later, in 2005. It was part of a series of models exclusive to the Apita chain of stores - all done up as Emergency vehicles and it features a few more details than the original release, like the painted tail lights. It features the markings of the Aichi Prefecture Police. The next model is one of the new Tomica 4D models, which feature sound and vibration. I chose the Crown Patrol Car because of my love for Police cars (in small scale, not in my rear view mirror). From the outside, it’s almost idential to the 110-6 which has been in production since 2009. According to the instructions, it has “up to 45 minutes” of playtime before the batteries need replacing, So I’ll have to take it easy, This one has generic “Police Department” markings. 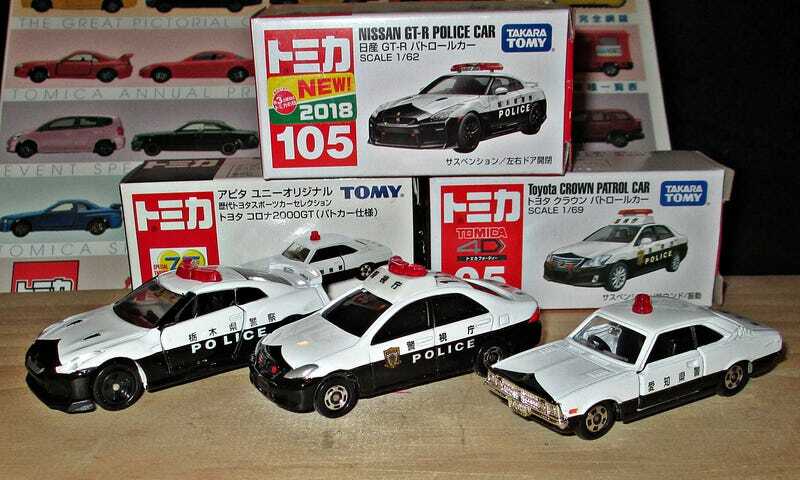 This one has the markings of the Tochigi Prefecture Police, It continues the long line of Tomica Police sports cars - and yes, the Japanese Police really do have these. Lucky guys. I hope you enjoyed this little law enforcement special - and your weekend as well.